Hello and welcome to the 290th installment of the SWD. Syrian Arab Army reportedly captured Nasiriyah, Hamdaniyah, Tell Maraq, and Abu Dali from the rebel factions in the northern Hama. Hayat Tahrir al-Sham’s Ibaa News Agency reported destruction of two Syrian Arab Army’s vehicles by two improvised explosive devices in the vicinity of Abu Dali. Furthermore, according to the same agency, SAA‘s Kornet position was destroyed and several elements killed, when an anti-tank guided missile targeted the position in Umm Haratayn village. 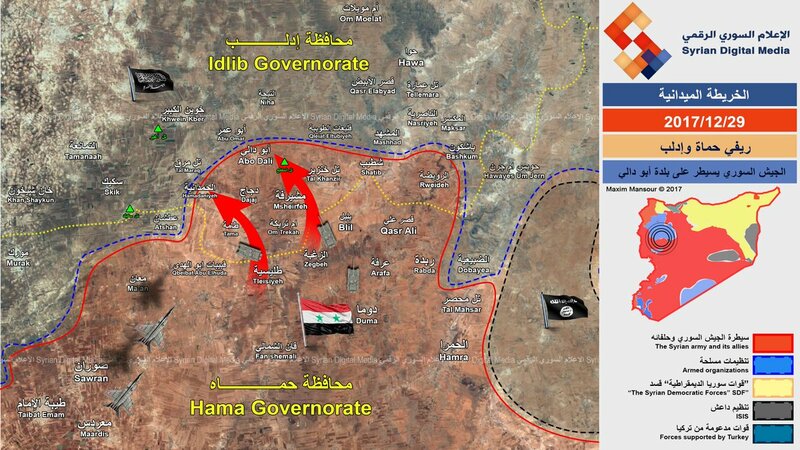 Clashes between the Syrian Arab Army and rebel factions continue in Abu Omar’s area. Correspondent of Sama TV, Abdul Ghani Jarouk was wounded and his cameraman Kareem Qabishou killed by the rebels in the border area between Idlib and Hama governorates, as they were covering Syrian Arab Army’s operations against the rebel factions. Hayat Tahrir al-Sham clashed with the Islamic State in the village of Abu Khanadiq in the northern Hama. Hayat Tahrir al-Sham destroyed Islamic State’s technical and reportedly killed several fighters of the group with an anti-tank guided missile. Russian Air Force conducted over a dozen of air raids over the villages of Al-Jataniyah, Zaghbir, Jib Sukkar, and Al-Janaina in the eastern Hama. 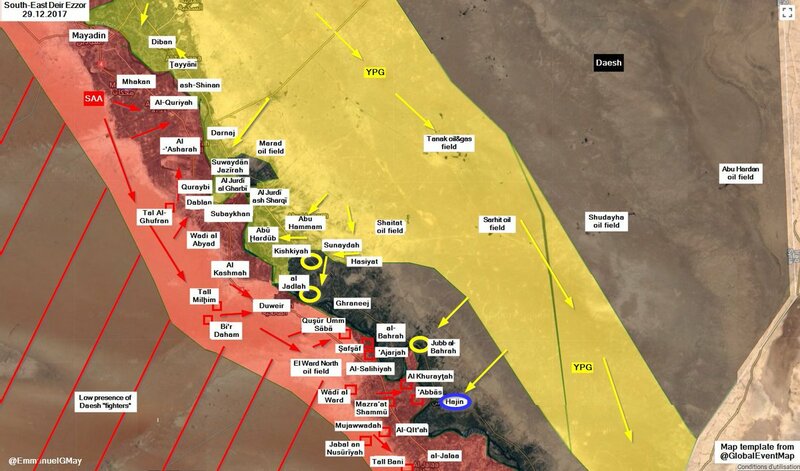 Syrian Democratic Forces reportedly captured Tell Khaymat Hajin, Jubb al-Bahrah, Al-Kushkiyah, Al-Qahawi, Al-Jabal and northern outskirts of Hajin from the Islamic State in the eastern Deir al-Zour. Islamic State’s Amaq Agency reported Islamic State’s attack near Al-Kushkiyah, which reportedly killed 13 fighters of the Syrian Democratic Forces. Islamic State’s Amaq Agency released three statements regarding the area near Al-Bahra village, northwest of Hajin. According to the agency, Islamic State launched a counterattack near the village and killed three fighters of the Syrian Democratic Forces. Two other statements reported destruction of a Humvee and a bulldozer and targeting of SDF‘s elements near the village with anti-tank guided missiles. Syrian Arab Army’s artillery shelled Douma, Harasta, Hammouriyah, and Jisreen in the East Ghouta. Shelling of Hammouriyah reportedly killed one and wounded several civilians. Ahrar al-Sham launched a new attack against the Syrian Arab Army in the ‘Army Armored Vehicle Base’ in Harasta. Before Ahrar al-Sham’s attack started, Abu Dujana al-Jazrawi conducted a SVBIED attack against the SAA‘s positions in Al-Ajami neighborhood of Harasta, near the ‘Army Armored Vehicle Base’. Al-Jazrawi was reported as Hayat Tahrir al-Sham’s commander from Saudi Arabia, even though his allegiance to HTS can not be confirmed for now. Syrian Arab Army did manage to repel Ahrar al-Sham’s attack. Faylaq al-Rahman’s security detachment arrested Anas al-Kholi, journalist from the East Ghouta. The order to arrest Al-Kholi reportedly came from the leader of Faylaq al-Rahman, Captain Abdul Nasr Shamir (Abu Nasr) himself. Evacuation of Hayat Tahrir al-Sham and part of the fighters of the rebel Jabal al-Sheikh operations room and their families took place today, as reportedly ten buses transported 120 individuals in total from Beit Jinn pocket to Idlib. The second batch of evacuations will go towards Daraa and will consist of the other part of the fighters of the rebel Jabal al-Sheikh operations room, rebel fighters from Daraa and Quneitra and their families. Islamic State assassinated Al-Hashd al-Shaabi (Popular Mobilization Units) official and three other elements near Tell Abta, southwest of Mosul, according to the Amaq Agency. Islamic State’s sleeper cells in the city of Hawija reportedly took control of a part of the city during the night. Iraqi Security Forces reportedly recaptured all of the areas that the sleeper cells managed to capture. Islamic State’s improvised explosive device destroyed Al-Hashd al-Shaabi vehicle and killed an element of the group, as well as wounded two other elements near Al-Abbasi in Hawija district. Islamic State’ Amaq Agency reported destruction of Al-Hashd al-Shaabi vehicle with an improvised explosive device in Al-Farahatia area near Al-Ishaqi. Three Islamic State’s improvised explosive devices northeast of Muqdadiya killed eight people, including the mayor of Al-Bazul village, according to the Amaq Agency. Islamic Emirate of Afghanistan (Taliban) ambushed a group of Afghan National Army’s soldiers in Chimtal district, killing three and wounding one soldier, as well as destroying a tank. Islamic Emirate of Afghanistan assassinated Afghan Local Police’s commander Abdur Rahim Hakeem in Charkint district. Islamic Emirate of Afghanistan seized Hakeem’s pistol after the assassination. Afghan National Security Forces operations against the Islamic Emirate of Afghanistan in Alingar district, resulted in killing of nine and injury of six elements of the group. Afghan National Security Forces killed eight fighters of the Islamic State in Achin district. Islamic Emirate of Afghanistan seized Afghan National Army’s military base in Gardez city, capital of the Paktia Province. Clashes for the base lasted for several hours, during which four Afghan National Army’s soldiers were killed and seven wounded. Islamic Emirate of Afghanistan seized three assault rifles and large quantities of ammunition. Islamic Emirate of Afghanistan raided two Afghan National Army’s checkpoints in Jeafarayano area of Sang Atish directorate and in Zanbur area of Ghormach district, killing and wounding several soldiers. Two elements of the Afghan Local Police defected to the Islamic Emirate of Afghanistan in Pay Asar area of Taywra directorate. The defected elements handed over four assault rifles to the Islamic Emirate of Afghanistan. Afghan National Security Forces killed one and wounded three fighters of the Islamic Emirate of Afghanistan in Qarabagh district. Islamic Emirate of Afghanistan raided Afghan National Army’s checkpoint in Shalghar district, killing four and wounding two soldiers. Similarly, IEA raided Afghan Local Police’s checkpoint in Gelan district, killing five and wounding four elements of the local police. Afghan National Security Forces killed ten and wounded four fighters of the Islamic Emirate of Afghanistan in the province, as well as destroyed several weapons depots and ammunition caches. Among the ten killed IEA fighters are two fighters from Pakistan. Islamic Emirate of Afghanistan took control of Afghan National Police’s checkpoint in Mala Aman area of Pusht Rod. Three elements of the Afghan National Police were killed in the clashes for the checkpoint, while the remaining elements withdrew from the area. Islamic Emirate of Afghanistan seized a PK machine gun, three assault rifles, and various ammunition from the checkpoint. Afghan National Security Forces’ operations against the Islamic Emirate of Afghanistan in Shah Joy district killed three and wounded four fighters of the group. Islamic Emirate of Afghanistan’s improvised explosive device targeted Afghan National Army’s foot patrol in Mizan district, killing one and wounding another soldier. Reports suggest that Afghan National Army’s commander of a checkpoint in Lelizo area of Shah Joy district, Dad Muhammad was killed by one of the soldiers of the Afghan National Army. Afghan National Security Forces conducted operations against the Islamic Emirate of Afghanistan in Nad Ali, Gurzek, and Marjah districts, killing eight fighters of the group, as well as destroying a fighting position, two motorcycles, weapons depot and ammunition cache. Islamic Emirate of Afghanistan ambushed Afghan National Army’s foot patrol between Jerash and Sangin districts, killing two and wounding one soldier. Similarly, another Afghan National Army’s foot patrol in Dago area of Jerash district came under the Islamic Emirate of Afghanistan’s shelling, which killed and wounded three soldiers. Islamic Emirate of Afghanistan’s snipers killed four elements of the Afghan National Army near Muhammad Ewaz Charrahi area of Marjah district. Similarly, three Afghan National Army’s soldiers were killed and one wounded by the Islamic Emirate of Afghanistan’s snipers in Takhta Pul area of Garmsir district. Afghan National Security Forces killed two fighters of the Islamic Emirate of Afghanistan and destroyed one vehicle in Maywand district. Between the 22nd and the 28th of December 2017 CJTF-OIR has conducted 38 strikes in Syria. CJTF-OIR‘s main focus in Syria at the moment is Deir al-Zour-Albu Kamal region where they did 37 strikes supporting SDF‘s operations against IS destroying three heavy machine guns, three IS line of communications, a UAV, two explosive hazards, a heavy weapon, an IS headquarters, two IS logistics centers, a fighting position, seven IS vehicles, an IS-held building and a staging area. Other area where one strike occurred is Al-Shadaddi destroying a UAV. Full report on CJTF-OIR strikes conducted in both Syria & Iraq can be found here. Islamic State’s fighters assassinated a lieutenant of the Somali National Army in Afgooye, Lower Shebelle province.